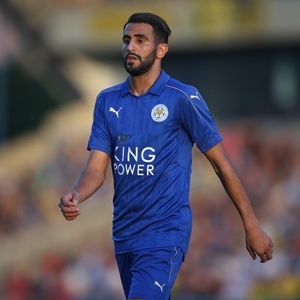 Cape Town - Leicester City midfielder Riyad Mahrez has left the Algeria national team camp to "formalise his transfer to his new club". The playmaker has long been a target for a number of top European clubs including Barcelona, Chelsea, Manchester United and Arsenal while Roma have had three bids rejected for the 26-year-old. Mahrez was in Algeria preparing for his country's World Cup qualifying matches against Zambia on Saturday and Tuesday, but was allowed to leave, with the transfer window closing on Thursday. A statement from the Algerian Football Federation read: "Leicester City's Algerian international Riyad Mahrez, who is currently with the national team in Sidi Moussa to prepare for the double confrontation against Zambia for the 2018 World Cup qualifiers, was authorised by the national coach Lucas Alcaraz and the Algerian Football Federation to make an express trip to Europe to formalise on Thursday his transfer to his new club.